The Indiana FFA State Officers team consists of seven high school graduates who have elected to defer their education for one year to serve Indiana FFA as youth ambassadors. 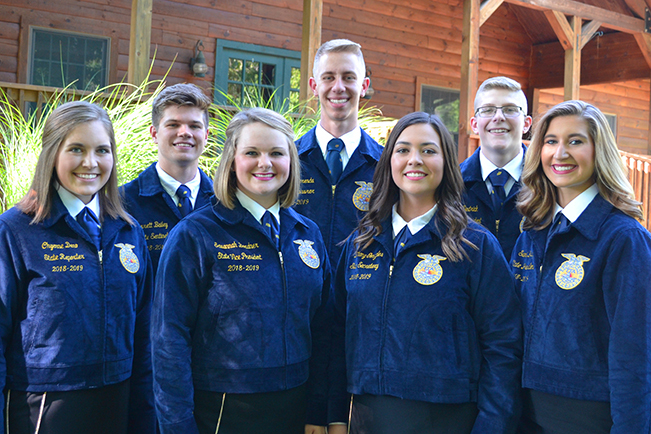 During their year of service, which begins and ends at the annual State Convention, these officers will travel the state presenting 10 three-day leadership conferences and speaking to over 8,000 FFA members, supporters and individuals involved in leadership and agriculture. Thank you for your interest in requesting an Indiana FFA State Officer at your event! The State FFA Officers are excited to serve the organization this year and keep members, supporters and sponsors believing in FFA! Section Directors are elected at large by the delegates from the 3 districts they represent during the annual State FFA Convention. 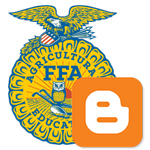 Click the image below to navigate to the Indiana FFA State Officer blog website. Have you recently requested an Indiana FFA State Officer to visit your function? Please take a few minutes and provide feedback about their performance! Click the link below. - 3 Past State Officers. Nom Com works together to organize the State Officer Candidate interview rounds and carefully determine the 7 lucky individuals who will serve on next year's Indiana FFA State Officer Team.